Marcotte is pleased to announce our 2nd year of sponsoring the Sarnia Sting Anthem program. 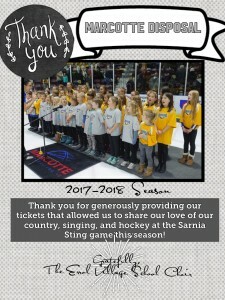 This allows students and their family to attend a Sting game, while the students with their class sing the National Anthem to open the hockey game. We are happy to give back to a community that is so supportive of us!